Phantom Ring: The Phantom power ring is able to act as conduit to the Red, Orange, Yellow, Green, Blue, Indigo and Star Sapphire spectrums. 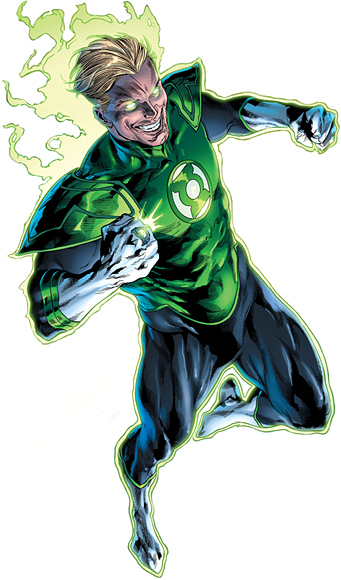 Effectively giving the Phantom Lantern access to the powers of all the Corps, including: Energy Constructs, Force Fields, Energy Projection and Flight. The Phantom Ring changes its Emotional Spectrum power source whenever the user feels even the slightest emotion, changing their personality entirely to match that emotion and its perspective power source. Frank Laminski grew up in a life where he was never noticed or appreciated as anything special, he felt unappreciated and completely average. He then decided to join the Air Force to gain a sense of purpose, but still went unnoticed. Soon after he overheard a conversation from his commanding officer's regarding who will test drive a new concept jet, The Flaming Spear. The commanding officer agreed to let Frank test drive it, but he pushed the jet to its limits, and as a result the engines failed. As Frank was crashing, Hal Jordan (who just received his Green Lantern ring) saved him. After he reported his crash, he was grounded, and not allowed to fly ever again in the Air Force, but he did not care about his military career anymore, the only thing he wanted in life was to be a Green Lantern. Frank soon left the Air Force and dedicated his life to training (both mental and physical) with the hope that whoever gave Green Lantern (Hal Jordan) his ring, would see his dedication and training and give him one as well. He tried this for years and years, all the while tracking every appearance of Green Lantern (Hal Jordan) and learned as much as he could about the Green Lantern Ring. As more time passed he watched as a new Green Lantern was chosen, then another, and then a third. However, Frank did not give up hope, and pushed himself even further, often times taking the most dangerous of jobs such as becoming a security guard in Arkham Asylum, and also honing in his firearm skills, learning as much as he could by reading various literature, etc. Just about when he was going to give up all hope, a Green Lantern Ring burst through his window, speaking the words: "Frank Laminski of Earth. You have the ability to overcome great fear. You have been chosen. Welcome to the Green Lantern Co-- Error. Welcome to th-- Error. Malfunction detected. Recalibrating. Rescanning. Frank Laminski. You do not have the ability to overcome great fear. You have not been chosen. Correct candidate located. Charting course: Guantanamo Bay, Cuba." The ring then zoomed away and found a new host in Simon Baz. It was then after this moment that Frank gave up all hope and fell into deep depression. But just when all hope was lost, Frank came back to his apartment after a long day to find a mysterious hooded figure in his room. The figure told him that he was watching him and tracking his movements for quite some time. This figure then tells frank of a certain ring that did not need to choose it's wearer, but one that anybody could use, the Phantom Ring. Frank asked who the figure was, so he removed his cloak to reveal himself to be none other than Volthoom, the First Lantern. Soon after, Frank followed the advice of Volthoom and travelled to the location of the two current Green Lanterns of Earth, Simon Baz and Jessica Cruz, who happened to be protecting the exiled Guardian of the Universe, Rami, the creator of Phantom Ring. Distracting them by setting a house on fire across the neighbourhood, he sneaked into the house, took the ring, and became the Phantom Lantern, but due to the nature of the ring it took the form of the ring that he had a strong emotional connection to, in this case willpower, and he became a pseudo Green Lantern.